Every year on the Sunday after Easter, the town of Pagani – situated between Naples and Salerno – celebrates the feast-day of the Madonna delle Galline, or ‘Madonna of the Chickens’. The festival has become quite well known throughout Italy in recent years on account of the traditional tammorre music that gets played there. The tammorre (which some see as the descendants of the tambourines depicted in Pompeian mosaics and paintings) have always been an integral part of the religious festivities, but over the last few decades they have started to attract their own secular audience in the wake of a wider musical ‘roots revival’. This means that much of the music at the Madonna delle Galline now happens at some distance from the procession and religious rituals. The sacred procession begins at around 9 am when the statue of the Madonna leaves her sanctuary, dressed in fine vestments and surrounded by doves given to her by parishioners that morning. Mounted on a trailer above a large bird-cage, she is driven around the town until the early evening, accompanied by a marching band, a group of priests, and anyone else who cares to join them. 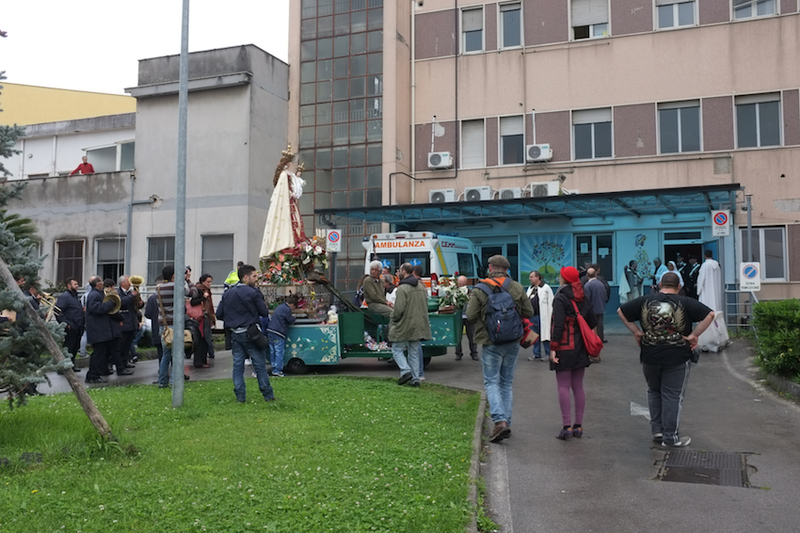 The procession stops at significant nodes along the main roads (churches, piazzas, crossroads and the hospital – which you can see in the photo below), allowing the residents of that place to touch and kiss her, give her compliments (‘quanto e’ bella questa Madonnina!’), let off fireworks, and deposit votive chickens in the birdcage. When I attended the festival last month, I chatted to one family who were waiting on the pavement outside their house with a chicken: they explained that all the chickens collected that day would eventually be placed in a pen in the church, at which point the parishioners would be able to go and purchase them – the offerings thereby being ‘converted’ into funds for the sanctuary. In 1500 some chickens, pecking, found a wooden ‘tavoletta’ [tablet, like the wooden ex votos featured in other posts on this blog] upon which was represented the Madonna del Carmine. The healing of a cripple [‘storpio’] in 1609 and numerous other miracles led to such an increase in devotion that in 1610 a church was dedicated to her. Just like a Christian Persephone, this Madonna was brought forth from the earth at the beginning of the year…when she was discovered by some pecking chickens. We should note that chickens (and birds in general) were sacred to the gods of Underworld. It is no coincidence that birds – together with pomegranates – appear in the funerary paintings from Paestum and other nearby sites, where they are always linked to the cult of Persephone, as recurrent symbols of death but also of fertility [my translation – original here]. This possible continuity with the chthonic religions of antiquity might be one of the more esoteric aspects of the contemporary procession, but it is worth noting that a similar observation has been made in relation to the presepe napoletano [nativity scenes from Naples], where the popular figurine of an old lady giving seed to a hen is sometimes interpreted as Demeter giving nourishment to her daughter Persephone [see for instance De Simone (1998), p. 25]. The choice of the chicken as a votive gift to the Pagani Madonna is, then, far from casual: rather, it functions as a potent reminder of the sanctuary’s miraculous beginnings, as well as perhaps gesturing towards Pagani’s deeper past, and the shadows of much older deities. Roberto De Simone (1998), Il presepe popolare napoletano, Turin. http://www.agroflash.it/2014/04/29/rimandata-a-giovedi-la-processione-della-madonna-delle-galline/ (news story about this year’s procession, which had to be terminated early because of the bad weather. The final part (including the ritual exchange between the priests and statue, in which a pair of chickens is swapped with a pair of doves) was rescheduled for the following week. What an Intriguing tradition! If there is a connection with Persephone, it is interesting (to me at least) that the contemporary tradition and explanation of the ritual date to the Counter-Reformation, making it a potential example of a (re)christianization of something older. It’s a bit tangential, but it reminds me of the legend of the miracle of Santo Domingo de la Calzada (http://en.wikipedia.org/wiki/Dominic_de_la_Calzada) that involved miraculous rebirth and chickens and led to there being a (still-occupied) chicken house his church. Thanks very much for that link, Phil! As well as the chicken connection I’m interested in the claim that medieval pilgrims gathered feathers from the sacred birds at S. Domingo to put in their hats (another ‘sacred souvenir’ example to add to my list). And very good point about the christianisation of the Persephone tradition. I’ll try to find out some more about the foundation story of the Galline – I haven’t found much in the way of secondary literature so far, and most books/websites just repeat the unattributed legend as though it were oral history, but there may be some archival sources at the sanctuary….